Background: The incidence of permanent pacemaker implantation after orthotopic heart transplantation has been reported to be 2%-24%. Transplanted hearts usually exhibit sinus rhythm in the operating room following reperfusion, and most patients do not exhibit significant arrhythmias during the postoperative period. However, among the patients who do exhibit abnormalities, pacemakers may be implanted for early sinus node dysfunction but are rarely used after 6 months. Permanent pacing is often required for atrioventricular block. A different cohort of transplant patients presents later with bradycardia requiring pacemaker implantation, reported to occur in approximately 1.5% of patients. The objectives of this study were to investigate the indications for pacemaker implantation, compare the need for pacemakers following bicaval vs biatrial anastomosis, and examine the long-term outcomes of heart transplant patients who received pacemakers. Methods: For this retrospective, case-cohort, single-institution study, patients were identified from clinical research and administrative transplant databases. Information was supplemented with review of the medical records. Standard statistical techniques were used, with chi-square testing for categorical variables and the 2-tailed t test for continuous variables. Survival was compared with the use of log-rank methods. Results: Between January 1968 and February 2008, 1,450 heart transplants were performed at Stanford University. Eighty-four patients (5.8%) were identified as having had a pacemaker implanted. Of these patients, 65.5% (55) had the device implanted within 30 days of transplantation, and 34.5% (29) had late implantation. The mean survival of patients who had an early pacemaker implant was 6.4 years compared to 7.7 years for those with a late pacemaker implant (P<0.05). Sinus node dysfunction and heart block were the most common indications for pacemaker implantation. Starting in 1997, a bicaval technique was used for implantation. 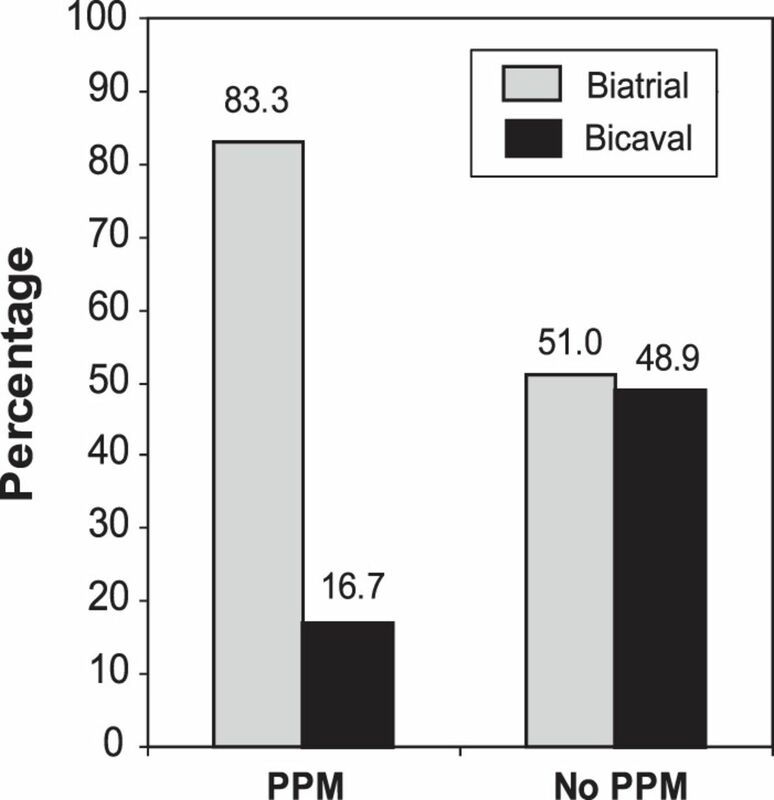 The incidence of pacemaker implantation by technique was 2.0% for bicaval and 9.1% for biatrial (P=0.001). Significantly more rejection episodes occurred in the pacemaker group (2.67 ± 2.18) compared with the no-pacemaker group (2.01 ± 2.05) (P<0.05). Conclusion: Our results show a decreased pacemaker need after bicaval anastomosis and that more patients who needed a pacemaker after transplantation had a pretransplant diagnosis of ischemic cardiomyopathy. In our cohort, the need for a permanent pacemaker was also associated with older donor grafts and an increase in the number of treated rejection episodes. The surgical procedure for orthotopic heart transplantation has undergone very few perturbations during the past 50 years. The early experiments by Lower and Shumway developed the standard biatrial technique of orthotopic heart transplantation.1,2 Use of the bicaval technique did not enter clinical practice until 1991.3,4 As the postoperative care of these patients became refined and standardized, the incidence of rejection and other complications was reduced. These factors resulted in increased overall survival. As a consequence of these improvements, the use of permanent pacemakers has declined. Pacemakers implanted for early sinus node dysfunction are rarely used after 6 months; however, permanent pacing is often required for atrioventricular block. A different cohort of transplant patients presents later with bradycardia requiring pacemaker implantation, reported to occur in approximately 1.5% of patients.10 The presence of late bradycardia is an ominous sign and portends a poor outcome. This study presents a retrospective investigation of a single-center experience that spans the first 40 years of cardiac transplantation. The goals of this study were to explore the indications for pacemaker implantation and the long-term outcomes and to directly compare pacemaker use between the biatrial and bicaval techniques. We also reviewed recipient and donor characteristics to elucidate any possible risk factors that would predispose patients to need a pacemaker following transplantation. This retrospective, case-cohort, single-institution study was approved by the institutional review board. Patients were identified from clinical research and transplant administrative databases. Information was supplemented with medical records review. Standard statistical techniques were used, with chi-square testing for categorical variables and the 2-tailed t test for continuous variables. Survival was compared with the use of log-rank methods, and statistical significance was defined by P<0.05. Between January 1968 and February 2008, 1,450 heart transplants were performed at Stanford University. Patient and donor demographics are presented in the Table. The bicaval technique for implantation of the donor heart was begun in 1997 at Stanford. The biatrial technique was used in 767 cases, and the bicaval implant was employed in 683. Eighty-four patients (5.8%) were identified as having had a pacemaker implanted following heart transplantation. Of these patients, 65.5% (55) had the device implanted within 30 days (early) of transplantation, and 34.5% (29) had the device implanted more than 30 days (late) after transplantation. No patients were excluded from the study. The mean survival of patients who had an early pacemaker implanted was 6.4 years compared to 7.7 years for those with late pacemaker implant (P<0.05). Sinus node dysfunction and heart block were the most common indications for pacemaker implantation. 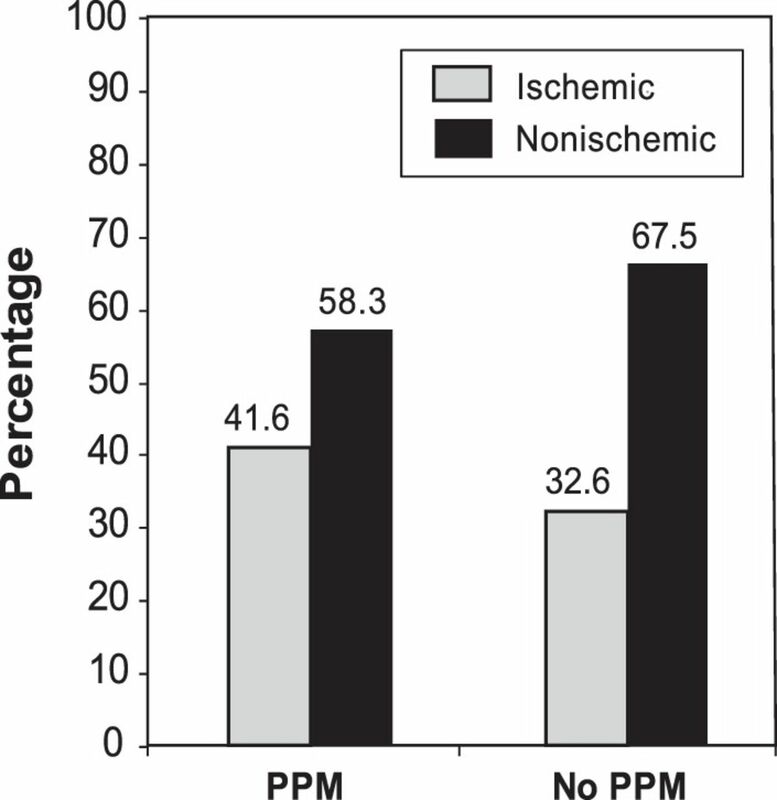 The pretransplant diagnosis of ischemic cardiomyopathy in the recipient had an increased rate of pacemaker requirement (Figure 1) (P<0.05). The incidence for pacemaker use in the bicaval group was 2.0% (14/683) compared with 9.1% (70/767) in the biatrial group (P=0.001). Of the 84 patients who received a permanent pacemaker, 83.3% had a biatrial technique and 16.7% had a bicaval technique (Figure 2). The average donor age was 28.5 years for the recipients requiring a pacemaker compared with 25.4 years for the recipients who did not (Figure 3) (P<0.05). An increased incidence of rejection episodes occurred in the pacemaker group. The mean number of rejection episodes in the pacemaker group was 2.67 ± 2.18 compared to a mean of 2.01 ± 2.05 in the cohort that did not require a pacemaker (P<0.05). Pretransplant recipient diagnosis and permanent pacemaker (PPM) rate. Surgical technique and permanent pacemaker (PPM) rate. 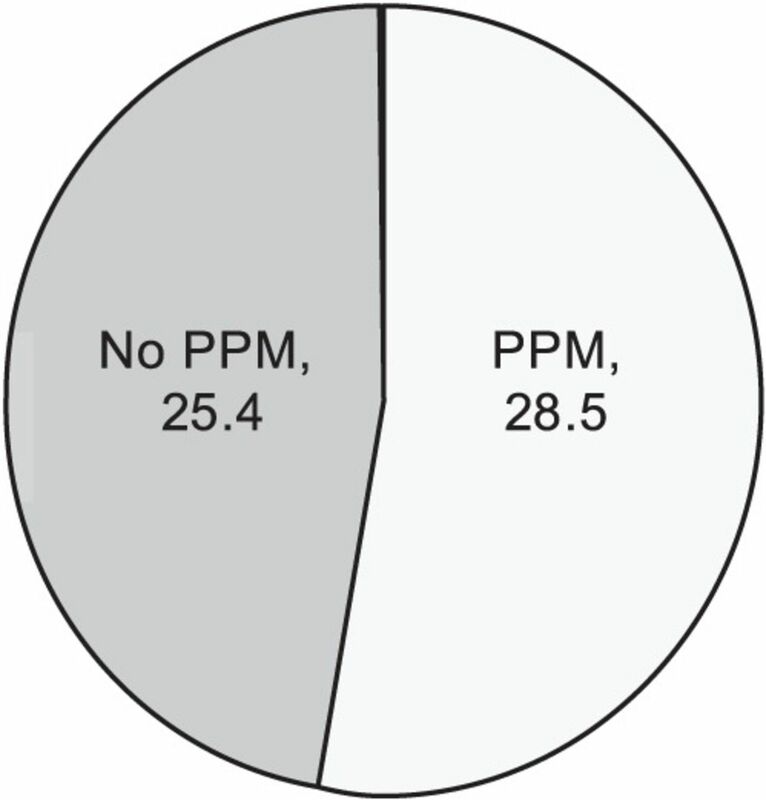 Donor age and percentage of patients requiring permanent pacemaker (PPM). Pacemaker use following heart transplantation falls into a bimodal distribution of early and late implantation. The early implants for bradyarrhythmias occur in the perioperative period, usually before discharge from the hospital. The recovery of the sinus node within the first 6 months usually obviates the need for permanent pacing in this cohort. The late implantation of pacemakers because of bradyarrhythmias or heart block is usually the result of an acute rejection episode or transplant vasculopathy. The majority of transplanted hearts leave the operating room in a sinus rhythm. However, after heart transplantation, arrhythmias are a common occurrence, with ventricular arrhythmias occurring in 65% and atrial arrhythmias in 25% of patients.11 Ventricular arrhythmias usually take the form of premature ventricular complexes followed by nonsustained ventricular tachycardia. Ventricular arrhythmias are rarely malignant, usually respond to medical management, and are not associated with rejection episodes. They may be the result of metabolic disturbances or ischemia/reperfusion injuries of the allograft.11 Atrial arrhythmias are most commonly premature atrial complexes, with flutter, fibrillation, and tachycardia occurring rarely. Atrial arrhythmias have been associated with acute rejection episodes and respond to treatment of acute rejection. Outside the setting of acute rejection, they respond to rapid atrial pacing, beta blockers, or cardioversion.11 None of these arrhythmias is an indication for implanting a permanent pacemaker. The overall pacemaker rate reported in this study is lower than that reported in 2 other large studies. In this series, the overall rate for permanent pacemaker implantation was 5.8% compared with 8.1%19 in a prospective study at the Cleveland Clinic and 10.9% in a review of the United Network for Organ Sharing database.22 While many factors may account for this difference, it may be attributable to variation in the institutional use of permanent pacemakers following heart transplantation. Bradyarrhythmias can be managed through a range of therapies, including temporary pacing, pharmacology, and permanent pacemaker implantation. The thresholds for placing a permanent pacemaker after heart transplantation likely vary widely among individual programs. Even though the surgical technique for heart transplantation has changed little during the years, much debate continues about the merits of biatrial vs bicaval anastomosis. The perceived advantages of performing the biatrial anastomosis are that it is technically easier than the bicaval technique and reduces the donor ischemic time. The theoretical advantages of performing the bicaval technique are that the intact donor right atrium can contribute to right ventricular function, the incidence of tricuspid valve insufficiency may be lower compared to the biatrial technique, and the rate of permanent pacemaker implantation also appears to be lower. A permanent pacemaker after heart transplantation may be required in the early postoperative period or much later after the transplant event. Our study and others show a decreased rate of pacemaker use with the bicaval technique when compared with the biatrial method. In our cohort, more patients who needed a pacemaker after transplantation had a pretransplant diagnosis of ischemic cardiomyopathy. Increasing donor age and an increase in the number of treated rejection episodes both resulted in a higher percentage of patients requiring permanent pacemaker insertion regardless of the technique employed. Demographic and perioperative factors associated with initial and prolonged sinus node dysfunction after orthotopic heart transplantation. The impact of ischemic time. Transplantation. 1991 Jun:51(6);1217-1224.